Interviewing with a recruiter can be an excellent way for you to find and land that perfect job. 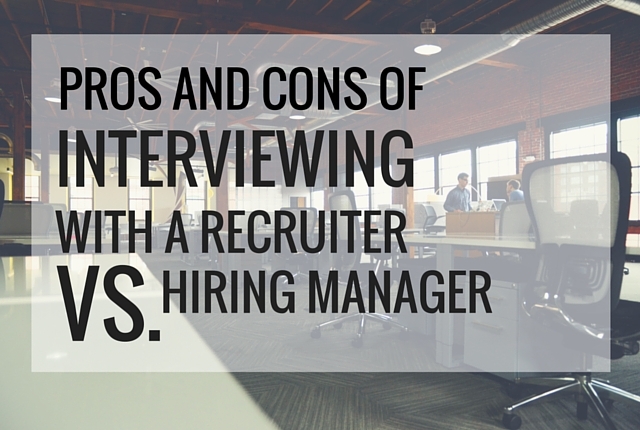 Of course, there are pros and cons to interviewing with a recruiter versus a hiring manager. If you have found a good recruiter, you will see minimal cons. However, if you have found a bad recruiter then you were probably better off going directly to the company rather than through a recruiter. This is why it’s important for you to recognize when you’ve got a bad recruiter. Pro: Interviewing with the recruiter offers practice for the interview. When you’re working with a good recruiter, the opportunity for interview training is extremely valuable. Look at your recruiter as your coach. She is supposed to know what the hiring manager is looking for and will be able to lead and guide you to a successful phone or in person interview with the manager. A good recruiter is going to be able to provide you with useful tips throughout the hiring process. These are tips that you would never receive if you went directly through a hiring manager. Simple tips such as appropriate dress, resume format, and handling gaps in employment are all things that your recruiter should be able to provide guidance on. In addition, knowing when it’s appropriate to ask questions about things such as salary and benefits are all things that your recruiter will be able to give you guidance on. Look at your interview and conversations with the recruiter as more of a training advantage and way to learn inside information on the job and hiring manager before hand. Con: Your recruiter could give bad advice. If you’ve found a bad recruiter, chances are she will provide you with little to no advice. Even worse, she may give you really bad advice. Pro: The recruiter will often know which way the hiring manager is leaning towards. Great recruiters know their clients and know where they stand. A good recruiter is going to not only follow up with you, but also follow up with the hiring manager for feedback and next steps. Based on conversations with the hiring manager, the recruiter is going to know if your interview went well and if the hiring manager is looking for anything additional from you. This is information that you likely would not have access to if you interviewed with the hiring manager alone. Con: The recruiter could drop the ball. A bad recruiter may not follow up as needed. This is not good for you. When your recruiter is not following up with the hiring manager, there is a good chance that the hiring manager will forget about you. When your recruiter drops the ball, things could end badly for you and the potential opportunity. Remember, that it’s important to know when you’ve found a good recruiter in order to avoid the cons mentioned above. When you have a really good recruiter on your side, there will be nothing but added benefit when you interview through the recruiter versus through the hiring manager. What pros and cons have you seen in the past when going through a recruiter versus a hiring manager?